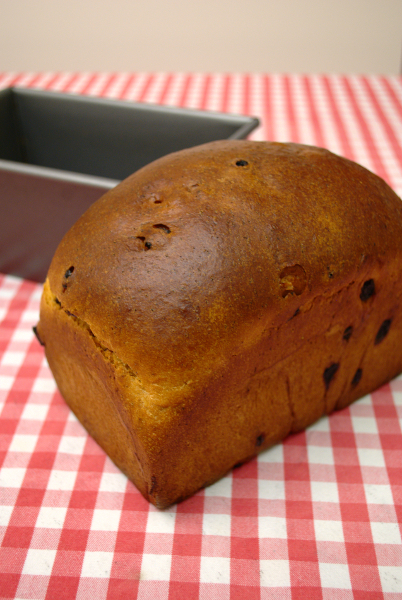 Bara brith is a fruit-bread from Wales, the name translating as ‘speckled bread’. Although it sounds distinctive, there are so many different versions that there is very little anyone can definitively say about it. Some make it with yeast, others treat it more like a cake and use baking powder. It may include eggs and butter, or one or the other, and although it always contains dried fruit, some bakers advocate soaking it in strong tea before use. In its yeast-leavened form, it has a number of characteristics that make it quite difficult to make successfully. Over the last few months I’ve been playing around with different recipes in an attempt to discover a reliable formula. All the recipes I have consulted use milk, butter and sugar in the dough, as well as dried fruit. This combination produces a difficult environment both for fermentation and for dough development. Sugar, like salt, is hygroscopic – it attracts and absorbs water. Since the yeast cells also need water, the presence of sugar will interfere with fermentation, slowing it down as the proportion of sugar in the dough increases. Many sweetened breads don’t use sugar in the dough itself. Chelsea buns and lardy cake are good examples: the sugar is sandwiched between layers of dough at the shaping stage, rather than being thoroughly incorporated. Bara brith is unusual because a relatively high proportion of sugar is included at the mixing stage. Hard fats like butter, lard and vegetable shortening can interfere with gluten development for a similar reason. The protein molecules in flour that make up gluten also need to absorb water, but when fat is mixed with flour it coats these proteins and repels water. Provided the proportion of fat is not too high, it will not prevent gluten development, but it may well slow it down or limit it. Finally, dry ingredients like fruit, nuts or seeds will interefere with the formation of the gas cells that cause the dough to rise. The reason here is a bit more mechanical. These gas cells are effectively bubbles, and any dry ingredients you use will have a puncturing effect on them as they swell. In short, the dough for bara brith presents the baker with a challenge on several fronts. I have put a number of recipes through their paces with disappointing results, even though some of them came from sources I have found very reliable in the past. Through a series of experiments, though, I’ve come up with a recipe that works pretty well. My starting point was Elizabeth David’s recipe from English Bread and Yeast Cookery, which is itself adapted from one published by the long-defunct Wales Gas Board (a strange source, I know). Straight-up, this recipe delivered a very dense, heavy loaf. I made a number of adjustments, reducing the amount of dried fruit and increasing the proportion of milk and yeast. I also incorporated the fruit before bulk fermentation, whereas David’s recipe incorporates it just before shaping and proving. David’s basic spice mixture, which works well, is two parts nutmeg and pepper (white works best), to one part each of cinnamon, cloves and ginger. I ditched the cloves. Can’t stand the stuff. I’ve doubled the amount of yeast in order to compensate for the effect of the sugar on fermentation. Commercial bakers might use a special strain of ‘osmotolerant’ yeast in a recipe like this, which has been bred to ferment effectively at lower moisture levels. As far as I know, there are currently no domestic suppliers of this specialised form of yeast. I’ve also reduced the overall weight of fruit by roughly a third. 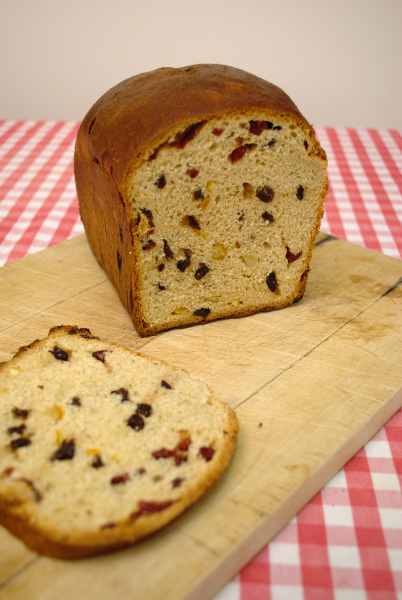 I find that many recipes for fruited breads include far too much. Although David’s recipe calls for raisins, currants and peel, you can use whatever appeals to you. As it happens, I’d run out of raisins and used some cranberries to make up the weight. Put the flour, salt, sugar, spice and easy-action yeast (if using) in a bowl. If you’re using fresh yeast or traditional dried granules, rehydrate it before adding. Melt the butter in a pan on a low heat. Once melted, take it off the heat, add the milk and pour it over the flour mixture (mixing the milk with the butter cools and disperses it). Mix to a dough and knead by hand for 15 minutes. Now add the dried fruit. Pat the dough out flat and press the fruit into it before folding it in half. Then gently knead the fruit into the dough until it’s thoroughly incorporated. Take your time: dried ingredients don’t mix easily into bread dough. You will probably find to start with that some of the fruit keeps escaping. Just prod it back in and keep going until you’re satisfied that the fruit is fairly evenly distributed. You could mix the fruit in at the start with all the other ingredients, but I prefer not to do this as the softer fruit tends to get squashed. Leave the dough to rise in a covered bowl. You’ll probably find that it doubles in bulk more quickly than usual, in around 40 minutes. At this point, shape the dough for a 2lb loaf tin and and leave it to prove. This will take longer than usual – one and a half to two hours, depending on the ambient temperature. Preheat your oven to 220°c. Once the dough is peeking over the lip of the tin, bake it for 50 minutes to an hour. A fat-rich dough like this always needs a longer bake than a ‘lean’ loaf does. You will find, though, that the crust will be well browned after about 30 minutes, so at this point cover the loaf with some tin foil to prevent it from burning, and check it every now and then in the last 10 minutes. Once baked through, leave the loaf to cool on a rack, covered in a tea towel. It needs to cool thoroughly before eating; I recommend leaving it 24 hours. Now slice thinly, cover in more butter than is good for you, and put the kettle on. I was just about to Make David’s original recipe from my old 70s copy of her book, stopped & check online. Used your recipe instead & It’s Delicious. 220’C was too hot for me & wondering if i can replace some of that milk for tea to pre-soak the fruit? Hi Sarah, I’m glad you liked the recipe! You could certainly replace some of the milk with tea – I say go ahead and try it out. Experimenting is one of the most rewarding aspects of baking (and cooking in general).